sit back while we work hard to get your return! We purchase apartment buildings that have great upside potential. Then we add value to the building, such as rehabbing, changing the property manager, and/or increasing occupancy. After we increase its value, we sell the building for a profit – quickly providing a higher than average return to you. Real estate is today’s wisest choice for low risk investments. Apartments offer a high reward, but the average investor may not have a few million on hand, nor the experience of securing, rehabbing or managing an apartment building. Forced Appreciation is our area of expertise. Increasing rent and decreasing expenses forces the building to go up in value, thus quickly creating a greater return to you. This is the number one reason why our investors have the potential to earn above average returns. 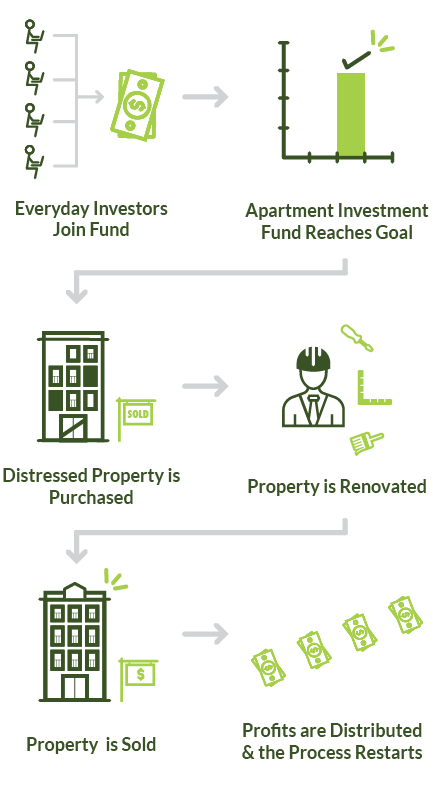 Anthony Chara and Jeff Halbe started Apartment Investment Fund (AIF) because they saw a missed opportunity to create great investment returns. Anthony and Jeff have more than 25 years of combined apartment ownership of apartment buildings valued above $48,000,000. Simply provide your name and email address below and we’ll email you a deeper look at our fund immediately, as a PDF.